What does “quality” look like in a child care program or preschool? Quality programs and preschools have standards in all areas including curriculum, teaching, staff, assessments, health and safety, among others. When you enroll your child in a quality program, you can be assured that he or she is playing and learning in the best possible environment. Below are some things you should be aware of and should consider when looking for a quality early childhood education program (courtesy of Pennsylvania Early Learning Keys to Quality). Small group sizes and adult-to-child ratios that encourage the best opportunities for a child’s development. Caregivers or teachers who have experience and education in early childhood development. Opportunities for meaningful parent involvement. Learning opportunities that promote your child’s success in school. Participation in accrediting programs such as Keystone STARS. Children in a quality setting will not only gain intellectual skills, but also social skills that will prepare them for the school environment. Lower staff-to-child ratios increase your child’s individual attention while in care. A quality care setting includes a staff trained to care for children and their needs. Quality care promotes a positive relationship between parents and the caregiver. Parent involvement is a priority. Age-appropriate learning materials and activities give children the opportunity to learn and grow. A quality program will be respectful of children’s and parent’s cultural, ethnic and special accommodations. A quality program will have business practices and policies in place so parents know what to expect in various situations. The basic need of a quality child care setting is to ensure that the children in care are in the safest environment possible. Parents have assurance that their child is in a safe, positive environment without jumping from provider to provider. Quality providers participate in accrediting programs (such as Keystone STARS), to continue striving for higher quality early learning experiences for children. You should answer the following questions when visiting an early childhood education program. Health and Safety – Is the program licensed? Is the license posted? Are the teachers trained in first aid and CPR? Are the floors, tables, bathrooms, toys, and equipment clean and safe? Do the outside play areas and equipment appear to be safe and in good condition? Teacher/Child Interactions – Do the teachers and children appear to enjoy one another? Are children’s needs being met individually and with sensitivity? Physical Environment – Is there enough space for the children? Are toys within the children’s reach? Is the environment inviting and attractive? Are play and activity areas organized? Nutrition – Are provided meals and snacks nutritious and well-balanced? Program – Are there a variety of activities to match the child’s age and changing interests? Are the children involved in hands-on activities? Teacher Qualifications- Are the teachers educated and experienced in early childhood? Adult-Child Ratio – Does the program meet DHS or other appropriate regulations for adult-child ratios? Is there enough staff to meet children’s needs? Teacher-Family Communication – Do teachers communicate regularly with families? Is the family’s involvement encouraged? Cultural Sensitivity – Are various cultures, ethnic groups, ages, and abilities represented in pictures, play, and activity areas? Fortunately, there are two programs that help make it easy to find quality care. 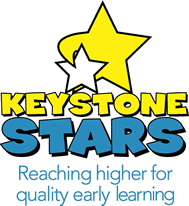 Keystone STARS is Pennsylvania’s Quality Rating System (QRS) for child care programs. PA is taking an active role in emphasizing quality. Contact ELRC #16 to find a center near you. In addition, NAEYC Accreditation is a national program of the National Association for the Education of Young Children. More than 20 years ago, NAEYC created an accreditation system to improve the quality of education and care provided in programs for young children. NAEYC Accreditation has become the mark of quality, helping parents find the best possible early childhood experience. 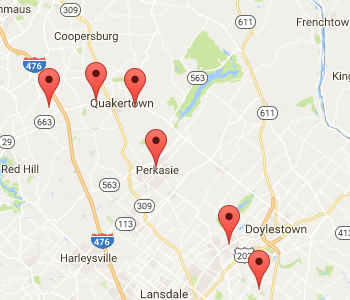 Pennsylvania Pre-K Counts provides high quality pre-kindergarten services to 11,000 3 and 4 year olds in Pennsylvania. Grantees in provide both half-day and full day programs for children at risk of academic failure because of low income, language barriers (English is not their first language), or special needs issues. To learn more about eligibility and enrollment, contact the following grantees.